Rapture, Blister, Burn may go down in history as the first feminist play to end with brainy female characters toasting Phyllis Schlafly, that bête noire of the Equal Rights Amendment, without sarcasm. It's no gimmick. Gina Gionfriddo's intellectually ambitious comedy, reopening the question of women choosing between career and family, allows that all choices are valid, even mediocre ones. A bit dour, perhaps? No. 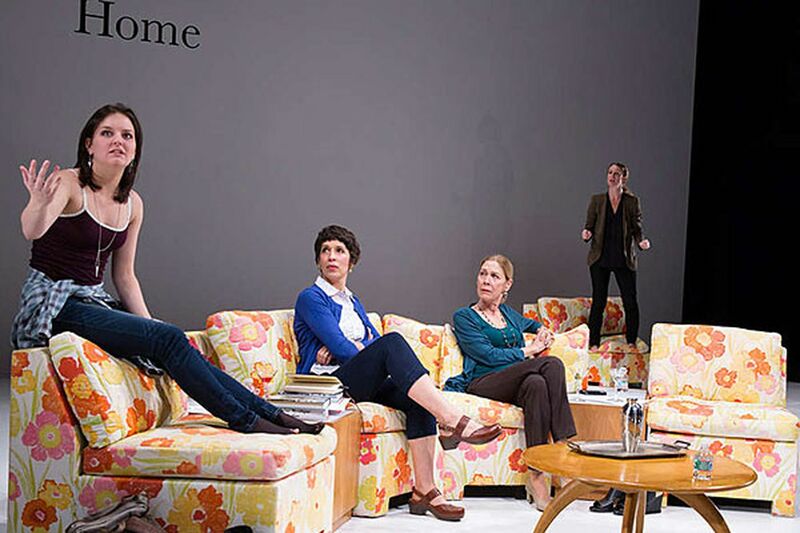 Rapture, which opened Wednesday at the Wilma Theater, is part of a growing genre that might be called war-of-the-brain-cells plays, such as Yasmina Reza's 2008 God of Carnage, with intelligent urbanites talking, drinking, and destroying each other's pretensions. For the record, Gionfriddo leaves Reza in the dust. The stylish production designed by Kristen Robinson opens with a house furnished with children's toys (nothing for adults), setting up a fanciful atmosphere for life-changing matters to be handled with a light touch. Lack of realism allows characters to deliver lines facing the audience, asking "Is this anything like your life?" The opening mystery, not solved until near the end, involves a phone call made during a drunken blackout. What was really said? Less clever techniques for bringing together the right characters include a feminist theory class with just two students. Also, the play's implication that people can't really change after age 40 is at odds with most realities that I know. Luckily, lines that might normally get a titter become illuminating thanks to Joanna Settle's incredibly nuanced direction and a cast that knows how to speak volumes with a squint of the eyes or a missed beat. In general, physicality keenly supports the play; when not sitting, characters seem smartly choreographed. All actors pull their considerable weight: As the celebrity career academic, Krista Apple-Hodge seems awfully healthy for a blackout alcoholic, but she masterfully commands the stage with inventive delivery of the language. As her mother, recovering from a heart attack, Nancy Boykin could be diagnosed simply by the way she walks. Maia DeSanti found increasing humanity in the control-freak wife/mother, and Campbell M. O'Hare, filling out this three-generation gallery of women, had the best comic timing of all. The token male, Harry Smith, showed how engaging a supposed loser can be. Wilma Theater, 265 S. Broad St. Through Nov. 2. Tickets: $10-$25.